This is the first of what I hope will be a regular series reviewing the myriad of musical and theatre performances I see in Edinburgh. I’ll try to give a review of both the show as a whole, and then the particular cast I’ve seen, along with a star rating. There’ll also be a list of the most useful and interesting songs for exams and auditions as well, since this is, ultimately, a teaching blog. I will open this review by admitting to having seen Ghost before. I was lucky enough to grab a standby ticket to see it in it’s original run at the Picadilly Theatre in London in December 2012 and I loved it. When I heard there was going to be a national tour, I had my ticket broker (well, my friend with an ATG Theatre Card) get us front row seats for the Edinburgh run. It was worth it. 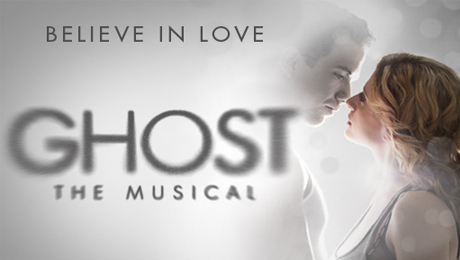 Ghost is, as the title suggests, an adaptation of that classic Patrick Swayze film from the early 1990s. Unlike another Swayze/musical adaptation, Dirty Dancing, the creative team behind Ghost were, well, more creative. The show features more than a dozen original songs, wonderful incidental music, and still has room for a rendition of Unchained Melody. Dave Stewart (of the Eurythmics) and Glen Ballard (also a “pop song” writer) have shifted genre from pop into music theatre seamlessly and their score is what really makes this show brilliant. Despite a change of cast and director from the London production, their music still had me in tears at the heartbreaking “With You” sung by Mollie and laughing away at Oda Mae Brown’s numbers “Are You a Believer?” and “Outta Here”. There are a number of wonderful examples of counterpoint where Sam, Mollie and Carl are given different melodies to sing over one another such as “Suspend My Disbelief/I Had a Life”. The book was adapted by Bruce Joel Rubin from his own screenplay, which means the story is still as moving as the original film without there being any major changes to the plot. Special note should also be made of the designers (Rob Howell, Hugh Vanstone, Tim Lutkin and Jon Driscoll) who used wonderful LED screens to show us images of everything from downtown Brooklyn to the inside of Subway carriages. Paul Kieve is the Illusionist (what a brilliant job!) behind the myriad of visual tricks used to enable the Ghostly characters to walk through walls, and appear to move objects while invisible to the audience. The sleight of hand used to swap a single actor for a corpse and a ghost at the moment of a character’s death was masterful – even from the front row I couldn’t see exactly how it was done! The cast had some very big shoes to fill, and they did an admirable job. I certainly wouldn’t imagine anyone seeing this show for the first time would be disappointed. Stewart Clarke (Sam Wheat) has a hugely powerful voice which was used to great effect as Sam struggled to come to terms with his new ghostly state. I enjoyed his new, more jovial take, on the living Sam in the early scenes, but he perhaps became a tad too angsty as a ghost. Acting opposite Stewart was Rebecca Trehearn, who conveyed Mollie Jensen’s conflicting emotions very well. There was an unpleasant nasality and dullness in the sound of her voice when she moved into the upper registers during her solo items, but, during the reprise of Unchained Melody at the end of the show, her voice proved to have a lovely sweetness of tone throughout. This suggests that it is the musical director to blame and not the actress. David Roberts (Carl Bruner) and Wendy Mae Brown (Oda Mae Brown) both deserve recognition for excellent performances in the secondary roles. Stevie Hutchinson as the Subway Ghost also did a fantastic job at a part which requires both athleticism and the ability to rap. The remainder of the cast provided additional characters and an excellent ensemble. There are some impressive dance routines throughout the show, as well as some wonderfully choreographed passers by who move with great physicality. I would highly recommend this show! Bring tissues, you will cry at least once. Or more often, if you’re me. I hope that long after the tour is finished, this show is still remembered for it’s moving solos and great chorus numbers. It certainly deserves recognition as one of the best shows to come out of London’s West End in the last few years. This entry was posted in Musicals, Reviews and tagged 4 stars, musicals, playhouse, reviews on 15th May 2013 by .